The Witching Hour is midnight to 1am, when all things paranormal are supposed to be about, except the devil, as he has his own time: 3am, the opposite of Christ’s time at 3pm, the time Jesus was said to have been crucified. The Hour of the Wolf is 3am to 4am, the hour between night and dawn, the opposite of twilight (which should really move with the time of year). It’s when the wolf is at your door, when most babies are born, your sleep is the deepest, when evil things have their greatest power, and insomniacs face their true selves – and their greatest fears. The Dead Hours are 2am to 4am; it is when deaths occur, when the body’s bio-rhythms are at their lowest and it’s also when most ghosts are seen. Do more people see them at that time because their own bio-rhythms are low and so they are more susceptible to seeing them, or because their low bio-rhythms make them more prone to imagine things? If I could answer that, I could also probably prove whether ghosts exist or not, and if I could prove that, I’d either be very rich and very famous, or out of a job. I’ve spent years avoiding watching Most Haunted for two reasons: one is the swearing level, and the other one is that when something allegedly happens they scream and run away – what’s the point in being there if you run away not towards?! If you’re going to get that hysterical regularly, then you’re in the wrong job. Actually, there are other reasons, but they’re the obvious ones. Tonight though I decided to grit my teeth and sit through a re-run of the Golden Fleece show because of the local connection. I think they managed a whole 30 seconds before they got their facts wrong, a particular bugbear of mine and one they kept repeating: it’s a rebuild from around 1840, not 500 old! Lady Peckett didn’t become “enamoured” of being a lady – it was her legal right to keep the title even after her husband was no longer Lord Mayor in 1703. Her husband John Peckitt didn’t die in the pub because it didn’t exist in his lifetime, and the house he lived in was the one next door anyway! Herbert’s House once had a triple gable, covering the site of what’s now the Golden Fleece, but as already stated it isn’t this building. The Canadian airman who died in the staff quarters was Geoff Monroe, not Jed Harkin, he fell from the former room four on to a glass corridor which was at the back of the pub, most likely he landed where the corridor to the kitchens now is. This is getting painful to watch, I may have to give up. P.S. I could see the wings fluttering on that “light anomalies” in the third and fourth segments. Thank you to everybody who sponsored me, I’m sure the Yorkshire Air Ambulance Charity will appreciate the donations. Weird reflections… I don’t remember taking the photo, and I can’t work out if I was inside or outside of the building at the time it’s so distorted on here. I think outside, but I’m not 100% sure. how bad my cold was going to be. I started with the cold at 2am on the morning of October 27, funnily enough at Haunted, where I was working at the time (I’m the night caretaker who allows ghost hunting groups in and out – and locks up after them), and now, just over two weeks later, I still have it. I debated postponing the overnight vigil until I was better but it wouldn’t have been the same doing it on any other night of the year. Anybody who has been round Haunted will know just how cold it is, I spend enough time in there that I know how cold it is, but normally in the early hours I’m behind the counter cuddling the radiator whilst one of the companies hiring the house is in the main, cold part of the house. When I lock up I’m not around long enough to appreciate just how cold it is and besides I’m constantly moving. 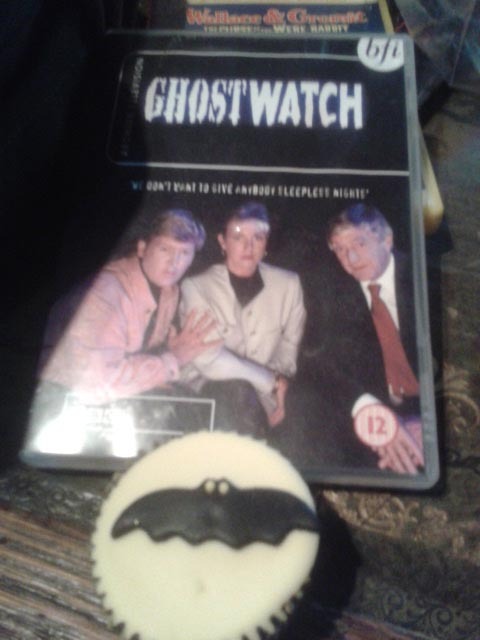 As a mental warm up for the evening, I took part in the National Seance 2012 – not an actual seance, but a group watching of the fabulous Ghostwatch programme. Next year, on the 21st anniversary of the show, find a copy (or a friend with a copy) and join in – search on Facebook for details or follow the blog here. Cakes supplied by Mysteria and Ian Lawman, bless ’em. Going from the shop to the Stained Glass Room without a coat was enough for me to be not shivering but shaking with cold, and we’re not going in to how cold the toilets were! The only really weird thing I can report back, that I cannot put a logical explanation to, was footsteps in the kitchen at the start of the night. As Mysteria were setting up, I went to speak to Annie, who runs the Softpots Secret Garden, and grab a coffee from our kitchen was at the back of the building, above Annie’s workshop. I’d forgotten she wasn’t in with it being a Wednesday, but the lights were on and doors open as there’s a fire exit accessed through the same doorway. I walked through and called her name, obviously there wasn’t a reply, but I heard footsteps overhead – at the time, I was directly below the kitchen – so I assumed she was in the kitchen. I ran straight upstairs and of course no sign of her. So with all this big haunted house to play with, and all my gadgets, which did I use? My favourite one: my brain. To some people this will sound like a wasted opportunity not to have set up traps and cameras with nobody else there to disturb them, but that would also mean there’s nobody there to verify I haven’t faked things. There were also two other major factors that influenced my decision. The first one is to do with the reasons for conducting an investigation. A discussion on ASSAP’s Facebook page recently about whether a vigil is a valid form of investigation, I think the majority of people believed it could be a part of one, but wasn’t valid in its own right. This lead me to wonder if we haven’t lost our way a little in the world of paranormal investigations. Q: I’m not saying we abandon science entirely, but why do we investigate a particular building or site? A: Because we’ve been told its haunted. A: Somebody, usually a person or people not conducting a ghost hunt, saw or experienced something. Q: Do we ever investigate buildings without reputations? Q: So why is that initial experience valid enough to prompt an investigation, but a repeat of it in front of an investigator is not valid? Without other people there with expectations of how an investigation is conducted, I was free to go back to absolute basics: watch and listen. I have had a conversation with somebody recently who is sceptic but open-minded with it: his exact stance is that he doesn’t dismiss the possibility of ghosts, but won’t actually believe until one comes up and literally slaps him around the face. He doesn’t go on investigations, but has been in spooky buildings in the past waiting to see what happens, and has used Ouija boards and is again open-minded about them. Like myself, he doesn’t believe they are the source of all evil, they usually say more about the person using them than anything else, but just occasionally something weird does come out of them. Weird, but not dangerous. He is also in favour of gadgets, as he wants to see a scientific, repeatable result when conducting experiments to prove the existence of ghosts, and so far, nobody has managed that. It was during a conversation with him about gadgets that the second thing that influenced my decision came up: just what gadgets are valid, and why? And why are they all so expensive? Has anybody else noticed that you can at least quadruple the price of an instrument if you say it can be used for ghost investigations? These latest ones, ghost boxes, usually priced at £70 and upwards, are modified £15 scanners. Elitism is taking over ghost investigations. Without meaning to sound old and cynical (but I know I am going to), I remember the days of small groups conducting private ghost hunts in buildings for free, just as Gaussmeters were becoming popular. Before they became EMF Readers. Before they became discredited. And yes, I still have and use one, but I didn’t need it at Haunted because it would only tell me what I already know: where the electrics are.  A number of things in my big ghost toolbox have long since been put in the category of ‘looking for trickery.’ Tales in the early days of faked results, caused not by the group faking but by one rogue member or even someone at the venue wanting to spice things up, made me wary. Sourcing electrics for audio set-ups was why I kept mine. I have walked through a venue (the security guards let us sneak in so I’m not at liberty to say where), in broad daylight, and watched as a particular corridor has made everyone, myself included, recoil under the tense atmosphere. I flung a door open, expecting untold horrors behind it, to find the main electrics for the building. What we had experienced was the charge in the atmosphere – no Gauss/EMF meters with us, it was a ‘now or never’ opportunity with no time to go home to grab kit. So now we have to pay for venues (ghost tourism, the phrase I first coined ten years ago and now used around the world, is big business – and you can’t expect these venues to run at a loss, they have to make money too), bonds (we’re all paying for a few bad apples), for insurance (a positive step), for mediums if we use them (and why not, they’re working too), snacks and drinks are expected, and then there’s the cost of gadgets on top and as I’ve already said, they don’t come cheap any more. Small ‘hobby’ groups are being priced out of the market, which I don’t see as a good thing. I miss them. I miss being part of one. My voice doesn’t allow me to run public events any more, and even before it went, I was becoming disillusioned with public investigations: too many people thought it was acceptable to turn up drunk, or stole things, or abused staff members, or each other, or broke things, or on one occasion tried (and failed) to set up a bar tab in my name before the event. I’d have loved my old team to be with me on Hallowe’en, but then it wouldn’t have been something ‘different’ as a charity event, so I had to go it alone – and without the expensive gadgetry which has replaced all the centuries of ghost stories and folk-lore. Yes, I am definitely becoming old and cynical. And I plan to stay this way. The Hull Daily Mail ran an article on Friday, November 9 which contains a much better ghost image than the rest of this year’s offerings, from the CCTV at The Manchester Arms. The article and film can be viewed here. I’m not saying it’s definitely a ghost, but I do think it’s worth a closer look. I’ve been alone since 2am, at Haunted. The house itself is freezing, so at the moment I’m sticking close to a hot coffee and the radiator, although I have had a little wander about on my own. I’ve been sat in the house alone now for just over an hour, nothing thrilling to report! There’s been a few strange noises, shouts and even some singing but all of it was just echoing in off the street. The hum of the street cleaner was an odd one to place for a moment! Last lot of people that went past were very loud, but at least they had cleaner language than the ones I heard earlier. Scary things happening, none of them paranormal… so far! For a moment, I thought I heard the creak of a door opening. After straining my ears for a few seconds, I realised it was a very whiney voice out in the street! Less people going past now, but the ones who are going past the door are very loud. The regularity of the police vans going past are a comfort, shame they’d just done a sweep when the last refrigerator lorry shot past, an hour before he’s legally allowed down Stonegate. I know the streets are virtually empty, but if someone had stumbled off a kerb or out of an alley in to the path of that one, they’d be dead. He was so fast I almost didn’t get chance to note the company name down. Wasn’t sure what was going to get to me first, the cold or tiredness. Tiredness won. Rather than freeze one one of the sofas I tried to get comfy on a chair next to the only radiator, and succeeded. Would probably still be asleep now if my cold hadn’t decided to kick back in, nearly choking me. About half an hour ago had an ever so slightly surreal moment when a bin wagon went past, at a reasonable speed… backwards. It then reappeared heading the right way, stopping outside for a few minutes. I’d forgotten until then how scary I found the film Duel. So far this week I’ve made it in The Press, and done a brief, half-awake interview on the morning show on Radio York (7.20am on October 31 to be precise). I feel better for going back to bed for the morning, followed by a hot bath, but I really don’t need this cold for tonight: if it’s not bad enough with the creaking floorboards and whispering pipes (not Mr Pipes… I hope!) in the house, the howling winds inside, and my squeaky boots, I now have a weird squeaking noise when I breath out. 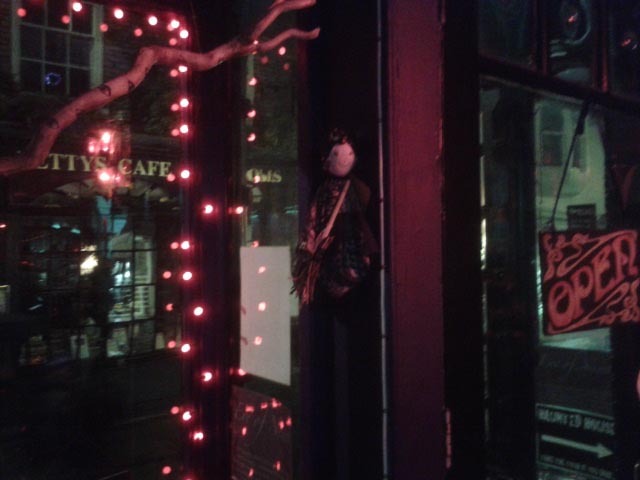 In a moment of madness I came up with a great idea for Hallowe’en night: why don’t I spend it alone somewhere spooky… somewhere like Haunted. The better idea was doing it sponsored for the Yorkshire Air Ambulance Charity. I’ve done a lot of ghost hunts over the last ten years, and even spent a night alone in the Roman Bathhouse in York, but ten minutes alone in this particular building even makes me nervous. The house will be open for tours during the day, with a ghost hunt taking place during the evening run by Mysteria, then I’m locked in from 1.30am until sunrise at 7am. Regardless of whether you believe in ghosts or not, in this old spooky building in the early hours you’d need nerves of steel not to jump at every noise. Creaking floorboards, warping slightly as they cool down, will become in your own mind footsteps; water in the pipes will become whispered voices; noises in the street will echo through the quiet and convince you that you are not alone. I’ve been here to lock up after ghost investigations and I tend to get out as quickly as I can because it does become very eerie, I have convinced myself in the past that somebody has lingered behind because I was sure I could hear them, but it was just my mind playing tricks. This is what has me so nervous now: not the prospect of ghosts, but my nerve giving out over things my mind has conjured up. However, I have also been here when doors have opened and closed on their own, hinges creaking loud enough to be heard throughout the building. There were other people with me then, and the first time it happened we assumed somebody had broken in, having searched the building thoroughly we found nobody, and this happened several times through the night. Somebody asked me if the doors were rigged up to open automatically, if anybody believes that then come and take a look at them: this is a listed building, and Haunted prides itself on NOT having gimmicks, there is nothing like that in here. There are a lot of accounts from staff, visitors on the tours and people on ghost investigations that make me think twice about dismissing everything as tricks of the mind. Possibly the oldest ghost story in York, told by Laurence Sterne, is from this very building, and there are several more that long pre-date the building becoming Haunted. And the experiences here vary: hair being pulled, people being pushed about, objects moving about especially when there has been building work here, staff members encountering people out of hours only for them to vanish when chased, voices from empty rooms, temperature anomalies, and a whole range of photographs and recordings of strange things. It’s why Haunted is so popular with ghost investigation companies. During the vigil it will just be me and my pumpkin (plus a lot of coffee, torches and a computer), although I will be appearing on the live house cameras when I’m in the right rooms as well as posting to Facebook and Twitter throughout. And why am I doing it? I always like to do something as part of the ghost fest for charity, choosing a local and vitally important charity this year in the shape of the Yorkshire Air Ambulance. I wanted to do something a bit different to commemorate that it’s been ten years since York was declared the most haunted city in the world by GRFI. I’m very grateful to the staff for allowing me to do this, and you never know, I might come out of it NOT a quivering jelly! If anybody wants to sponsor me, no matter how big or small the donation, I have set up a Just Giving page. I’ll be tweeting as @Yorkghostfinder, and on Facebook as Ghostfinder General and on the Haunted, 35 Stonegate page. It looks like the Daily Mail is trying to redeem itself after being caught out by the ghost app by publishing, with a slightly more balanced viewpoint, some older ‘ghost’ photos. A nod to the Professor Richard Wiseman would have gone down better if they’d got the information right on SS Watertown photograph. Scary at face value (no pun intended), the photograph was analysed in this Fortean Times article which provided evidence that in my mind proves it can’t be real – ghosts or not, the photograph was tampered with as the configuration of the ship is wrong.